Monday - Saturday, 10 a.m. to 2 p.m. and 6 p.m. to 9 p.m. 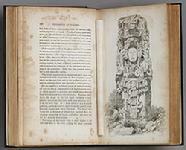 In 1844, Frederick Catherwood published "Views of Ancient Monuments in Central America, Chiapas & Yucatan" in London and New York. Three hundred copies were printed for sale, and in the more than 160 years since then, these images have continued to astonish and delight. For the first time in Mexico, a collection of these 25 magnificent lithographs are on view. Displayed in a restored Belle Epoque manse, the exhibition is faithful to the sensibilities of the mid-19th century aesthetics and sense of proportions and design. En 1844, Frederick Catherwood publico "Vistas de monumentos antiguos en Centroamerica, Chiapas y Yucatan" en Londres y Nueva York. Ahora, por primera vez, contamos con una exhibicion permanente de las litografias del Sr. Catherwood para que el publico conozca y disfrute de nuestra herencia cultural. Le invitamos a que venga a conocer las litografias que han conmovido el mundo entero desde ese entonces. HEMISPHERES, the in-flight magazine of United Airlines, has a feature story on us! Click on United's logo to the left, and read what United Airlines has to say about us! HEMISPHERES, la revista oficial de la linea aerea estadounidense United Airlines, ha publicado un articulo sobre nosotros. Suplicamos oprima el logo de United a la izquierda para que lo lea! Set in the unexplored jungles of Central America in the mid-1800s, this true-life adventure story will enthrall the armchair archaeologist. 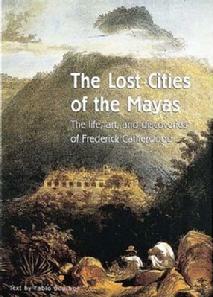 Recounted here for the first time is the adventurous life of Frederick Catherwood, the 19th-century English artist who discovered the lost Mayan cities in the jungles of Central America and the Yucatan plateau. In 1839 Catherwood and his American companion, John Lloyd Stephens, were the first Westerners to view the immense terraces, fabulous temples, and elaborate palaces that had been inexplicably abandoned ten centuries earlier. Superbly illustrated by Catherwood, Stephens' lively travel diaries recounting their extraordinary archaeological discoveries were published in 1841 and 1843. Using these journals and his own extensive research, author Fabio Bourbon has pieced together Catherwood's fascinating biography, which until now has been shrouded in mystery. Illustrating this handsome large-format book are more than 200 engravings made from Catherwood's original drawings. Also reproduced is Catherwood's Views of Ancient Monuments in Central America, Chiapas and Yucatan rare color portfolio considered to be his best work. Catherwood's other adventures are also described his first trips to Europe and Egypt, his later expeditions to Central America, and finally his experiences in California. This intriguing book about an intrepid adventurer/artist will appeal to anyone interested in exploration, architecture, and archaeology. OFFICIAL BOOK PUBLISHED BY ABBEVILLE PRESS, NEW YORK, now out-of-print, exclusively ours. Available for $75.00 USD. Shipping anywhere in Mexico and the U.S. is included. The Lost Cities of the Mayas by Fabio Bourbon. 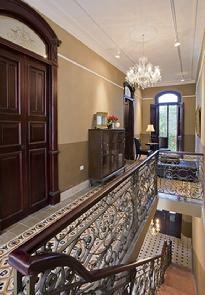 Located in the heart of Merida's historic center, Casa Frederick Catherwood is dedicated to the visual arts of the Yucatan peninsula, the land of the Mayab. In addition to housing a permanent exhibition of Frederick Catherwood's lithographs in the upstairs galleries, Casa Frederick Catherwood also has a terrace cafe, gift and book shop, and cultural exhibitions that are open to the public and free of charge.